The lack of formal doctrine is, I think, important. The Army has operated the program since 2010. A doctrine would both define the program’s objectives and methods, and exclude other possible uses. 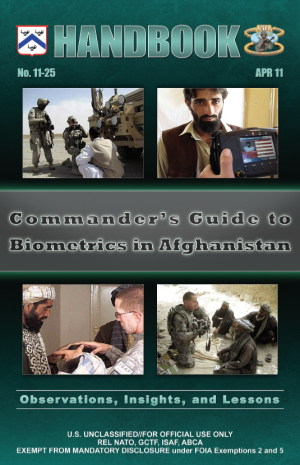 The Army does say that the program is useful “with identifying terrorists and criminals”. Who can argue with that? This data is increasingly used for criminal prosecutions. However, the Army has not discussed the accuracy of the scans, and forensic evidence they are compared to. So its hard to evaluate the soundness of the convictions in Afghanistan this program has been instrumental in obtaining. Many of these were obtained on the sole evidence of biometrics. The Army has not specified the number of convictions obtained, nor the what are the “countless other applications it foresees”. The lack of formal doctrine creates a freedom to pursue uses without justification. In a paper Dr. Gregory cites Colleen B. Bell discusses this. Colonial modes of governance were also experiments in public order, … render[ing] colonized peoples and spaces as laboratories for the limits and possibilities for disciplinary rule (1999:108–111). Drones as an instrument of warfare have received much attention, becoming a cultural trope. Pervasive biometric gathering and analysis has not. Yet biometrics are essential if remote forms of warfare, like drones, are to succeed in their cultural/mythic mission to create a discourse of surgical war, that appears always bloodless for the surgeon and beneficial to the etherized patient. Right now, the technology of gathering biometric data is very much “in your face”. Perhaps the technology being developed now in Afghanistan make that untrue in the future. Perhaps in the near future, not only our financial and communicative movements, but our public bodily movements will make us always findable. This is certainly within the scope of history of western colonial powers using non-white peoples as guniea pigs (Puerto Rican women and birth control, for example) for a greater capitalist gain. The unclear point with this experiment, is what is the end-game of this? You hint at this with “Perhaps in the near future, not only our financial and communicative movements but our public bodily movements will make us always finable”. Yikes! I don’t think this analysis is too fantastical, unfortunately.